Important Announcement About Synod Assembly 2019 – Location Change! Our synod was contracted with the Madison Marriott for our May 4 & 5 Synod Assembly. Unfortunately, the Marriott informed us recently that they will be renovating their facility and will not be able to accommodate our event. The new location for Assembly will be the Alliant Energy Center Exhibition Hall and the Clarion Suites at the Alliant Energy Center, Madison. The Clarion is conveniently connected by enclosed walkway to the Alliant Exhibition Hall. https://scsw-elca.org/wp-content/uploads/2019/01/Alliant.png 456 936 Robin Cherwinka https://scsw-elca.org/wp-content/uploads/2017/11/South-CentralSynodofWisconsinLogo.png Robin Cherwinka2019-01-16 14:08:012019-02-22 13:29:54Important Announcement About Synod Assembly 2019 - Location Change! Many of you today are asking the good Lutheran question, “What does this mean?” The implications of the decisions of the General Conference are not yet fully apparent: the Judicial Council must review controversial provisions later this year, and in any case the rippling consequences for ecclesial life will take much longer to work themselves out. Yet it seems clear that the conclusion of this process has not brought the greater unity for which so many longed. What we can say with certainty is that as the UMC takes its next steps, we in the ELCA will continue to walk with our full communion partner. We treasure the joyful memories of the 2009 Churchwide Assembly, where, in a near unanimous vote, we entered into this relationship. We are grateful also for the common witness, deepened friendships and shared ministries that have been the fruits of this decision. This relationship, and our commitment, have become woven into who we are as this church. Our life together as churches is a shared life together in Christ. We remember also that the same 2009 Assembly decided to open the way for those in same-gender relationships to serve as pastors. This week, as we watched the impassioned debates on the plenary floor in St. Louis, we recognized that these costly struggles are familiar from our own recent history, and acknowledge that some amongst us have experienced re-traumatization. In our present experience also, we have not fully grown into the commitments we have made. Yet, though a controversial decision at the time, our 2009 action has brought strength and blessings for our life and mission beyond what we could have imagined a decade ago. This church treasures the faithful ministries of those rostered leaders who help us witness to God’s love and invitation for all people. Their ministries are integral to who we are as this church. I ask this church, then, to continue by the side of the UMC, exchanging gifts and sharing burdens. In particular, we pray for them in their continued efforts faithfully to be church in the contexts we share. As we pray for them, we pray also for this church: may we be faithful to the calling to which we have been called, willing to confess our shortcomings and to trust in the healing, challenge and surprise of the Spirit of God, who calls us always forward. Are You Interested in Volunteering at YOUR Synod Office? It’s easy and fun and you can sign-up below. If you have questions please call Robyn Zimmerman at the synod office, 608.270-0201. Your synod is looking for people who are available and able to donate the precious gift of their time to help with general office work. This could be 2 days a week for a couple of hours in the morning/afternoon or an ongoing volunteer spot of every Monday afternoon, just as an example. Your synod staff would love the chance to get to know you and this a fun way to do just that. Pastors or Deacons or Vicars, are you interested in leading one of the synods Thursday worship services? It’s a short 30 minute worship with communion. It is open to all. Please bring a lunch to enjoy after worship. Thank you for considering this opportunity. Below is a template of our Thursday Service. Plan ahead, we have availability in February. • Gathering-Song is commonly done but feel free to do what ever you want. • Word & Message-Gospel either the narrative or lectionary from this week or really whatever you would like to use. • Prayers of the people- we will have some names to add to your prayer after you invite prayers. • Meal-Communion- that will be all set up for you and one of us will help you serve. • Sending – Sometimes people will do another song at the end but that is totally up to you. The service is normally 30 minutes long. You can really do it however you like as long as the 5 highlighted pieces are included. We do have plenty of hymnals here in the office. Congregations feel free to share on your church Facebook or web page through Thursday! https://scsw-elca.org/wp-content/uploads/2019/01/Volunteer.jpg 204 353 Robin Cherwinka https://scsw-elca.org/wp-content/uploads/2017/11/South-CentralSynodofWisconsinLogo.png Robin Cherwinka2018-12-18 18:01:202019-02-22 13:18:01Are You Interested in Volunteering at YOUR Synod Office? Two years ago, synod events were created around the theme of “Telling our Stories” and how important it is to be able to be share with others where we see God at work in our world…to be able to share the good news…especially in a world that so desperately needs to hear it. Three Sides is a new podcast presented by the ELCA that shares that third side of seeing God at work in the world and offers a fresh way to tell the unique, compelling and sometimes surprising stories of this church. Three sides presents diverse voices from across all expressions of the ELCA. livinglutheran.org/podcast and via iTunes, Spotify and Stitcher. Follow Three Sides at facebook.com/threesidespod and on Twitter @threesidespod. Not sure how to tell your story…listen to these and you will learn and will be inspired! Drone photo courtesy of Robert J. Dorn Jr. show flood damage in Cross Plains following an historic rainfall. LUAD is a synod ministry supported by your mission support. Thank you! And now, the work of this synod ministry has a time-sensitive need as they respond to recovery efforts for those in our synod impacted by the flooding from recent heavy rains. Please read this letter from LUAD President, Todd Long. Congregations have been asking where to send their special offerings for victims of the flood. At the end of the article, we provide information on where to send your special offerings in support of this important work. I would like to take a few moments to remind you and your congregation of our efforts. We are LUAD (Lutherans Assisting after Disasters) and are affiliated with the South-Central Synod of Wisconsin, ELCA. With all the rain we have had and the resulting flooding, we would like to remind you of our mission to help disaster survivors bridge the gap between emergency response and long term recovery rendering necessary services, donated items, supplies assistance, and social, emotional and spiritual support. We become engaged only by a call from a congregation within the Synod. This could be the Pastor or Council President. At the present time we have been called by St. Martins of Cross Plains. As water levels rise and more rain is in the forecast, it is a true possibility that other comm unities will or are being affected. We are ready to serve. We rely on volunteers from all congregations within our Synod and only ask of them what they are willing to commit in both time and service. There is always work for anyone willing to serve. We like to say, “We are family helping family.” There is an orientation meeting before any work is begun dealing with workplace safety and guidelines for service. We ask that you and your congregation extend your prayers for our work and explain our goals to any of your members so they might know of our needs for service. If there is need within your congregation, please extend a call to LUAD so we might be able to assist and advise you in this time of need. 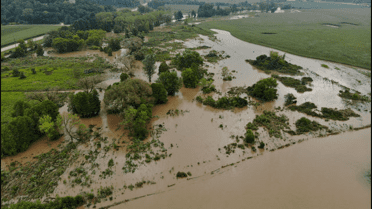 If you would like to make a donation or take a special offering in your congregation to help LUAD assist flood victims, please send it made payable to the South-Central Synod of Wisconsin and put “LUAD” in the memo. Thank you for your support of those who have been impacted by flooding in our synod!